Impact & Excellence Wins Gold! Sheri is proud to accept the Gold medal for her book Impact & Excellence from the Axiom Business Book Awards in the Philanthropy/Non-Profit category. Please read more about the award and the book below! “Now in their 9th year, the Axiom Business Book Awards are designed to celebrate excellence in business book writing and publishing by presenting gold, silver and bronze medals in 22 business categories. 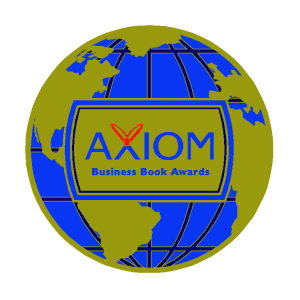 The goal of the Axiom Awards is to recognize the innovative, intelligent, and creative aspects of new business books that make us think, see, and work differently every day. In today’s volatile economy, it has never been more challenging or important for nonprofit and government organizations to compete, prosper, and excel. Author and consultant Sheri Chaney Jones notes that the implementation of data-driven strategies are the hidden success factors to organizational outcomes – increased revenues, efficiency, and improved stakeholder relationships among them. 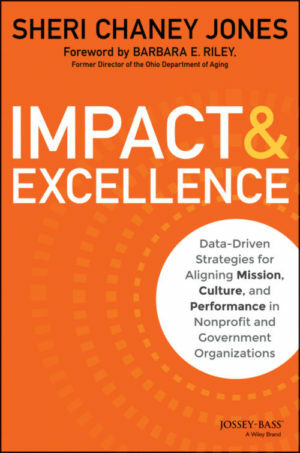 Chaney Jones’ award-winning book titled Impact & Excellence: Data-Driven Strategies for Aligning Mission, Culture, and Performance in Nonprofit and Government Organizations is the culmination of a four-year study of more than 200 government and nonprofit organizations in which she found a strong positive relationship between organizational outcomes and cultures that value data and measurement. Despite this, less than a quarter of these organizations have developed these cultures. Impact & Excellence highlights these findings and presents five strategic elements to success, what the author calls “the Five C’s of easy and effective impact and excellence.” Based on proven principles, with solutions that are easy to implement, these Five C’s often lead to sweeping change. Each chapter in Impact & Excellence includes discussion questions and action items to help leaders implement key concepts in their own organizations, while readers who purchase the book receive access to Chaney Jones’ Measurement Culture Survey and a free benchmark report. For her efforts to help leaders enable their social sector organizations to prosper and compete in today’s economy, Impact & Excellence received a gold medal from the Axiom Business Book Awards in the Philanthropy/Nonprofit/Sustainability category. Author: Sheri Chaney Jones is the president and founder of Measurement Resources Company. She has over fifteen years of experience helping government and nonprofit organizations achieve performance and budgetary goals. At the Ohio State University, Sheri teaches Creating Measurement Cultures as part of the Ohio Certified Public Manager’s Program. She holds a master’s degree in industrial and organizational psychology from Central Michigan University and is a member of the American Evaluation Association and the Ohio Program Evaluators Group.